And YOU’VE paid the price. Any one of these moments, the culprit putting your body through the wringer might not be what you think. It’s not your fault — we’ve been programmed to assume the trouble must be in our joints. So for ages (forever, really) — that’s all anyone has bothered to focus on. But what do those head-scratchers think is holding all of your joints together??? And for the first time ever, there’s finally a real solution that addresses tendon health. 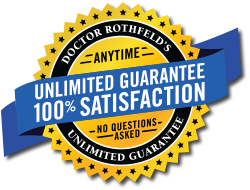 I’m Dr. Glenn S. Rothfeld, for Real Advantage Nutrients. And don’t worry. I’m going to tell you everything you need to know about it. Because until now, even if you were lucky enough to know it was your tendons... (and believe me, a lot of people don’t know.) once your tendons took a beating from the everyday stress you put on them for years and years, there wasn’t much anyone could tell you to do besides apply some ice, rest and maybe do some stretches. They might as well hand you a lollipop, too. IT’S JUST NOT GOOD ENOUGH...not by a long shot. But that ends today. You see, the only time you’re likely to hear anything about tendons is when you turn on ESPN and see the latest player carted to the sidelines. Things like typing or scrubbing dishes — or even daily walks can put extra strain on your tendons. Literally every single move you make uses your tendons. For instance, you’ve probably heard of the Achilles’ tendon. But that’s only 1 of over 4,000 tendons you’ve got throughout your entire body. And each of them needs to be in tip-top shape to help keep you moving free and easy. Which is why this discovery means so much. So I’ll explain what tendons are exactly and why they’re so important to your mobility and comfort. Tendons are tough, flexible bands, made mostly of collagen, that connect your muscles to your bones. They’re kind of like internal rubber bands that keep your muscles, bones and joints in place so you can move the way you were built to. And just like rubber bands, they can only be stretched so far and so many times before they start to give. Your tendons start to lose their elasticity, leaving you stiff and also more prone to injury. But the problem is, once your tendons are in trouble, they take a very long time to recover. Months — even years. Which is a shameful disgrace! You see, tendons are much more vital to your mobility and comfort than most people (and obviously most doctors) realize. You just used at least 38 tendons. But why put yourself through that? And why assume it’s your joints just because that’s all the mainstream ever talks about? No matter what they say, you don’t have to give up the active lifestyle you’ve always enjoyed. All of it could mean — It’s your tendons. That’s why I want to tell you about a way to take action now. Today, I’m catapulting tendon health out of the Stone Age and into the 21 st century. But before I tell you about my one-of-a-kind solution, there’s something you absolutely MUST know before I go any further. Now, I don’t mean to alarm you, but one of the most common ways the mainstream suggests to dull every day aches and pains may actually put tendons at risk. I’m talking about NSAIDs (non-steroidal anti-inflammatory drugs like ibuprofen)-Because some recent studies suggest that NSAIDs might lead to tendon breakdown-especially when taken for long periods of time. And to make matters worse, while NSAIDs are designed to help inflammation, when it comes to tendons, it appears that NSAIDs interfere with the normal way tendons naturally regenerate themselves. In most cases, inflammation is actually a good thing for tendons. If this sounds strange, that’s because tendon health has been largely misunderstood for a long time now. Most doctors assumed that all tendon trouble automatically meant inflammation. But it appears that’s not the case. In fact, it’s usually the opposite. Because inflammation is often the first step tendons take to begin healing themselves. So the last thing tendons need is to wipe out that inflammation with an NSAID. It all started when I assembled my team at Real Advantage Nutrients. I explained the situation and told them this was our No. 1 priority. You needed something different. And today, I’m proud to introduce it to you. It’s the only natural solution in existence that focuses directly on supporting your tendons, your comfort and your mobility. And I bet it’ll be the most triumphant tendon breakthrough in the whole history of medicine. During my search, one of my sources gave me the word about a group of daring researchers trying a new approach to tendon health. So I looked into it right away — combing over and questioning all the details and reports, page after page. So I contacted them right away and luckily, my reputation preceded me. And we started working together immediately to bring this revolutionary formula to the U.S.
Several times, as we got closer and closer to bringing this formula to you — I almost let it slip. It’s not every day you get to pull back the curtains on a cutting-edge breakthrough like this. This is just so unlike anything else because this solution sends aid straight to the source — right to your tendons. So I called it....Ultimate Tendon Support. But Ultimate Tendon Support goes toe-to-toe with that concern by giving you the nutrients your body needs to support healthy tendons. You see, tendons are notoriously hard to heal because they’re mostly avascular. That means they have a very limited blood supply and in some spots — they have no access to your bloodstream at all. So unlike other areas of your body, you can't just rely on nutrients being delivered through your bloodstream. You see, this trick isn’t giving your tendons the special nutrients. That would be nice but your bloodstream just doesn’t make enough “stops” at your tendons. So the way to do it is, give your body the nutrients it uses to build healthy tendons in the first place. And thanks to the groundbreaking formula at the center of Ultimate Tendon Support, now you can. It’s called TendoFit™ — and it’s a special dual-action blend of two essential tendon-supporting nutrients. The first nutrient is so impressive, scientists came up with quite a name for it: Mucopolysaccharides (Mu-co-poly-sack-ar-ides). Now I don’t want to keep typing that just as much as you don’t want to keep reading it, so let’s just call it MPS. Well, MPS is kind of like the glue holding all those bands together. So without the proper levels of MPS in your tendons, they’ll start to deform. Not only will you feel that, it can actually hinder your mobility, too. Because MPS helps keep the structure of your tendons strong and intact and keeping you on the move. So you can see that making sure you’ve got plenty of MPS is a key part of supporting healthy tendons. In fact, most of the research on MPS to date has been completely focused on joint health. And now we know it’s also one of the greatest nutrients you can give your tendons, too. And it was the second ingredient that had me out of my chair, pacing circles around my desk as I read about it in excitement. I’m sure you’ve heard of it, but collagen has far better uses than plumping the lips of Hollywood starlets. In fact, there are at least 28 distinct types of collagen in your body. And while they all have similar functions — they’re NOT all the same. Some are much stronger than others, for example. You see, your tendons are made of about 70% collagen and 95% of that collagen is Type 1. And that’s important, because when it comes to your tendons — the type of collagen inside them makes all the difference. In fact, one study found that as we get older, our bodies start producing more Type 3 and less Type 1. You see, Type 3 is much weaker than Type 1 and it can't handle the kind of force and stress your tendons take on a daily basis. Because while the structure of your tendons relies on MPS, the strength of your tendons depends on their collagen content. And they depend specifically on Type 1. And that's why Type 1 collagen makes the perfect partner to MPS. Plus, just like MPS, Type 1 collagen supports your cartilage, too. In addition to making up 70% percent of your tendons, Type 1 collagen is also responsible for maintaining the structure of your joint cartilage. This research looked great on paper but I insist on seeing real-life results before I recommend anything. And I couldn’t be happier to say, preliminary research on TendoFit shows very promising results. Because this special blend of MPS and Type 1 collagen was put to the test in Europe. The researchers that developed TendoFit conducted an unpublished, in vitro trial. That just means it’s one of those experiments with little petri dishes you see all the time on the science channel. And they found that TendoFit could — help stimulate the production of NEW tendon cells. Now, since this trial was performed on cells it used a higher concentration of TendoFit than can be packed into a supplement. But those new tendon cells didn’t just magically appear. It was the TendoFit that gave them the extra help they needed. Then, on the heels of this study, the researchers wanted to see how TendoFit worked for people complaining about their tendons. So they conducted a small study using people who felt discomfort in their tendons. All 80 participants were required to attend physical therapy sessions two to three times a week but only half of them were also given TendoFit. Then both groups were assessed in two ways. First, all participants took surveys after 3 months. And the TendoFit group described more improvement than the control group - especially in physical functioning. After 30 days...the TendoFit group was doing noticeably better than the control group. And that’s after just 3 months! When compared to the control group, TendoFit promoted a significant improvement in joint comfort, too. But I say hooey! Why wait when Ultimate Tendon Support is available right now. Well you won’t have to wait so long as I have something to say about it. You should know I’d never even think about putting some “filler” in my formulas. If the two ingredients in TendoFit were enough — we would’ve stopped right there. And we probably could have. I’ve spoken often of this superstar vitamin but it’s also one of your tendons’ greatest allies. Because Vitamin C plays a vital role in developing and maintaining the collagen that makes up your tendons, making it an essential nutrient for having strong, healthy tendons. Plus new research is starting to crop up showing even more benefits Vitamin C could have for your tendons. For example, in a recent study on animals, one group was given high-dose IV Vitamin C while the control group received none. And after just 21 days, the results weren’t just great — they were downright astounding. But even more incredible, when examined, the Vitamin C group also had more new tendon tissue than the control group. And that was after just 21 days! As soon as I confirmed that, I got on the phone right away and said we had to have Vitamin C in the formula. And I’m glad we did, because I can’t wait to see the full potential of Vitamin C unfold as more studies are completed. As I mentioned, the research for this incredible formula was conducted in Europe. So some lucky folks over there have already had the chance to give it a try. And from athletes trying to stay in peak condition to regular folks with stressed tendons from everyday life, this supplement has proven itself time and time again. In fact, it’s quickly become such a recognized way to support tendon health in Europe that the Spanish Association of Football Doctors officially recommends it. And now you don’t have to wait another minute for this revolutionary formula — Ultimate Tendon Support is now available in the U.S.! Tendon care has always been on my radar but back in 2009, I learned of a current investigation involving tendon health at the FDA. The second I caught wind of this, I went to work informing all my friends and readers. With every tiny caplet of Ultimate Tendon Support, you’re getting the proprietary dual-acting nutrients of TendoFit. Including the MPS working like glue, helping keep your tendons in the right shape and all those bands of collagen together. But these two powerhouses of tendon support don’t stop there. Remember, they’ll be working overtime to help keep your joint cartilage too. Plus, you’re getting a healthy dose of Vitamin C with its full spectrum of benefits for your tendons. Helping your body produce the collagen your tendons need to get up, get out, and stay on the move. Get out on that fairway and swing your club with confidence. Invite your friends over and never think twice about shuffling the cards when the deck makes it to you. Or just feel comfortable reaching for a can of soup from the top shelf, and opening it with ease. Take steps to support your tendon health now with the only formula created with your tendons in mind. Now you can be sure you’re doing everything you can for your tendons. And it’s as simple as taking one tiny caplet, twice a day to help keep your tendons on the right track. And there I was — finding them! And at the time, they decided to entrust me with their proprietary blend of tendon nutrients — exclusively. But now the secret’s out and I wanted you to know all about my original formula first — before some “new” version appears somewhere else. Because I’m sure once this news breaks, others are going to try and make knock-off versions of this original formula with ingredients from who-knows-where. So if you happen to come across another tendon formula — odds are it’s a total fake. You see, anytime there’s a breakthrough this big, it doesn’t take long for shelves to be lined with 17 watered-down versions of the original. And I wanted to protect this formula from the vultures as long as I could. Plus you can forget about twinges and pangs stopping you in your tracks. Or anytime at all...you decide Ultimate Tendon Support hasn’t given your tendons the support they needed, then return it and I’ll give you back every cent of the purchase price you paid. And since you’ve got nothing to lose I recommend trying it for at least 3 months. Because that’s the same amount of time used in the study where the physiotherapist noted a measurable improvement in comfort. And the people who took TendoFit along with participating in physical therapy showed more improvement with each passing month. Each time they were tested, their tendons were better than the time before. Then you deserve what Ultimate Tendon Support can give you. But please order right away — I can’t guarantee how long supplies will last once this news gets out. Plus right now you can lock-in the price you pay today, forever. But even if I end up having to pay a little more, you can ensure that you never do by enrolling in my Auto-Delivery Service when you place your order today. No matter how high the postal rates climb, you’ll never pay shipping as long as you’re signed up with Auto-Delivery Service. Plus, your orders will always arrive just like clockwork. Say you order a 3 month supply today so you can try it for the same amount of time used in that study I mentioned. With my Auto-Delivery Service, 3 months from now, just before your supply runs out, we'll bill the credit card you use today and ship you your next 3 bottles — just like that. Plus, if you change your mind — you can cancel any time you like. And with my Unlimited Guarantee backing every single purchase — there’s no risk in seeing what Ultimate Tendon Support can do for you. For your comfort, your mobility — and so you can live your life the way you want. From the tiniest tendons in your fingers to the tendons in your toes, Ultimate Tendon Support will have you completely covered. P.S. Now that you know the better way to protect your tendons, support your cartilage and keep moving the way you were built to — why wait another minute to find out what Ultimate Tendon Support can do for you. With a breakthrough this new big — don’t delay! Order Ultimate Tendon Support today and live the active life you want!